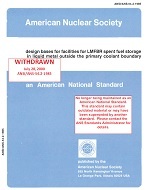 This standard sets forth the general design specifications, procurement, and performance requirements for operation of low-level waste (LLW) and mixed waste (MW) volume reduction (VR) processing systems for nuclear power plants and other nuclear facilities. 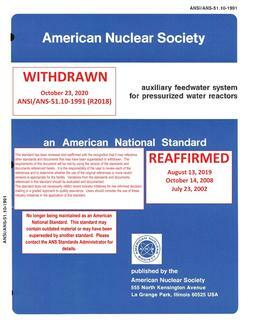 This standard may be applied to the specification of other LLW VR systems (such as government nuclear facilities) if consideration is given to any additional design features required by the hazardous nature of the wastes to be processed by them. For the purpose of this standard, a nuclear facility's LLW VR processing systems begin at the point where treatment of aqueous waste generates a solid waste, or where solid, slurry, or liquid organics wastes are collected, and ends at a waste storage, shipping, or disposal area. VR techniques may include processes such as drying, incineration, chemical decomposition, flash boiling, mechanical, or high-temperature reduction or destruction techniques, or both. Some VR systems may include, as an integral part of the system, a means for immobilization of the waste. 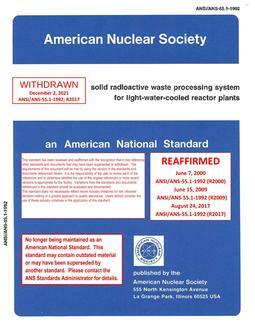 Compaction and solidification techniques are in the scope of American National Standard Solid Radioactive Waste Processing Systems for Light Water Reactor Plants, ANSI/ANS-55.1-1992.